The Columbia River Gorge is an 80-mile stretch of canyon running through the Cascade mountain range. The Columbia River itself stretches some 1,243 miles, beginning in British Columbia, creating much of the Washington/Oregon border, and running to the Pacific ocean. The Columbia River is the largest US river flowing into the Pacific, and its massive flow rate (as much as 740,000 gallons per second) combined with a rapid elevation drop make it the largest hydroelectric producing river in the nation. That’s really all you need to know—go make use of your favored mode of transportation, and go see Nature and go Do stuff! Or, if you want to know more, keep reading? 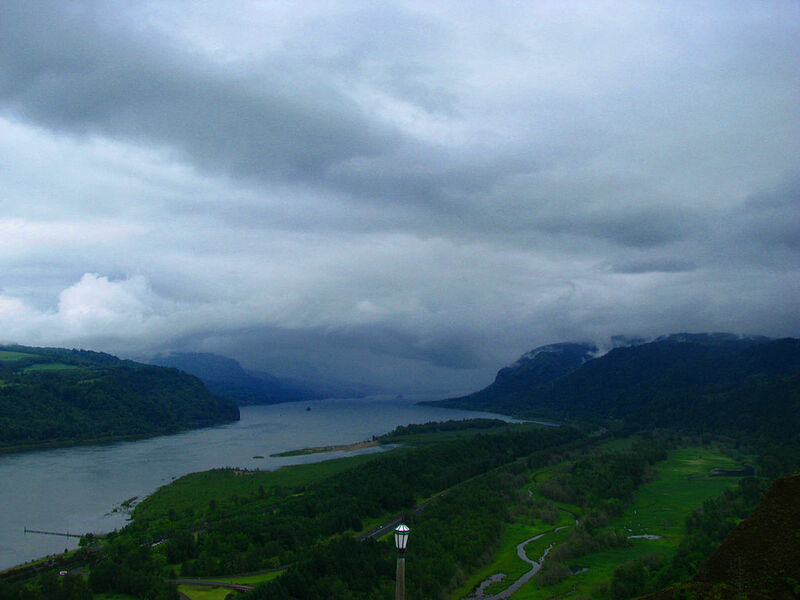 The Columbia River Gorge is a National Scenic Area, and a popular destination for recreationalists. The greatest draw is of course the scenic beauty of the place (thus its National Scenic Area designation), with the canyon being as much as 4,000 feet deep in places, in all its rocky splendor—except of course where the rocky splendor is covered by vegetation, as is the case in most areas. In those spots you’ll have to be content with vegetational splendor, which, honestly, is pretty great. The unique nature of the place gives it a trait like perhaps none other. Drastic changes in elevation and precipitation over the 80-mile stretch of the gorge give it a plethora of varying ecosystems & micro-habitats. Average rainfall varies in place-to-place from 10 inches a year, to 100 inches. If you drive along Interstate-84 by the gorge, you’ll see the speedily varying ecology firsthand, with areas of temperate rainforest towards the western end, transitioning to Oregon white oak, cottonwood, and Ponderosa pine, which then changes into grassland and a few Ponderosas and lodgepole pines. Along with trees, the diverse environments lead to quite a variety of other animals and plants throughout the canyon. Differences in atmospheric pressure on either side of the Cascades turns the gorge it into a sort of wind tunnel, with a constant wind averaging around 35 mph. This makes it a very popular location for windsurfing & kitesurfing. Some people enjoy other water sports as well. Those people are boring-er. For more info on recreation spots in the Columbia River Gorge, click here. Get more info about the gorge on the Forest Service website.